Prof Hubert Anson Newton FRS HFRSE (19 March 1830 – 12 August 1896), usually cited as H. A. Newton, was an American astronomer and mathematician, noted for his research on meteors. Newton was born at Sherburne, New York, and graduated from Yale in 1850 with a B.A. The Mathematics Genealogy Project lists his advisor as Michel Chasles. 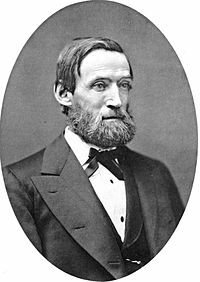 In 1855, he was appointed professor of mathematics at Yale. The study of the laws of meteors and of comets and their interrelation was his chief labor. He attempted to contribute to the theory advanced by Denison Olmsted of Yale in 1833 that meteors were a part of a mass of bodies moving round the sun in a fixed orbit. In 1861, he supervised the work of the Connecticut Academy of Arts and Sciences in regard to the August and November meteors. He became a worldwide authority on the subjects of meteors and comets. He won the Smith gold medal from the National Academy of Sciences, was elected an associate of the Royal Astronomical Society of London, served as president of the American Association for the Advancement of Science (1885), and was foreign member of the Royal Society of Edinburgh. Many of his papers on meteors were published in the Memoirs of the National Academy, the Journal of Science, and the American Journal of Science. In 1859 he married Miss Stiles.